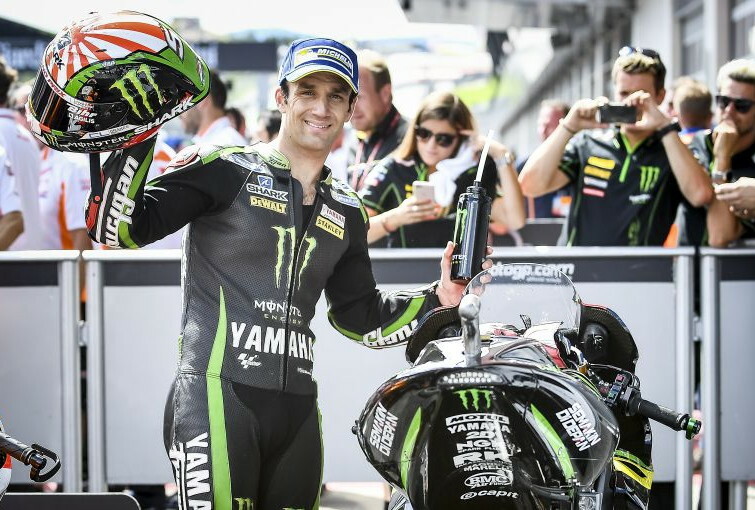 Johann Zarco will return to the Yamaha Tech 3 MotoGP team next year, but is unsigned for 2019. KTM entered MotoGP to win, as it has done in virtually every category of racing it has entered, both on-road and off. KTM realizes, of course, that no matter how good your bike is you need talented riders to take a championship. interestingly, I just read an interview about Zarco by his crew cheif over on motomatters, and in essence he said Zarco has been so good because he is smooth and rides like Lorenzo, which suits the Yamaha. In esscence..if Zarco made the move to say Honda or Ducati, he might suffer the same disconnect that Lorenzo is experiencing with the Ducati because the bikes demand to be ridden differently. Surely, “smooth” benefits all bikes regardless of character. As good a job as he’s done coming out of Moto2 and getting down to business so quickly, I think he is probably just one of those very adaptable riders. While I’m sure he could do better with one bike over another, he could probably make an impact wherever he goes. As an aside, I read where he thought the 2017 Yamaha chassis was great during testing and allowed him to go fast with much less physical effort. That in comparison to two top riders also known as for being pretty smooth said the 2016 was better. I think Zarco just wraps his head around changes quickly. Jeremy, then wouldn’t Lorenzo be doing better since he is the smoothest rider of all? He has been quoted as saying either the bike has to be changed to suit him or he has to change to suit the bike. And didn’t people (including you iirc) want Pedrosa to go to Yamaha when Lorenzo left because the bike would fit his smooth riding style? My point isn’t that smooth makes all bikes ridable, just that it benefits all bikes. With respect to the Ducati, Lorenzo likes to carry a lot of speed into the corners and turn the bike in hard. Every rider will tell you the Ducati’s main problem is that it doesn’t turn. Dovi has to carry as much speed before the corner then scrub it off fast before turning in. Both approaches require optimum smoothness. If you paid a lot of attention to Zarco in Moto2 or watched him during this year’s races, he doesn’t really have a particular riding style. He seems (to me) to ride in a style that suits the conditions for each particular race. In that way he reminds me of Rossi or Dovisioso or – the most extreme example of adaptability I’ve ever seen in motorcycle racing – Marquez. Lorenzo reminds me of Tom Sykes. He has absolutely mastered this particular riding style, but he sticks to it hell or high water even at tracks or in conditions where it doesn’t work. Competitors recognize where the weaknesses are after a while and exploit them, yet Lorenzo (and Sykes) still stick to it. Pedrosa is somewhere in between. I think the Yamaha, which has traditionally been less physical to ride and able to carry better corner speed would work for Pedrosa because I really think he needs a bike he doesn’t have to wrestle like the current Honda. Zarco, I think, could wrestle the Honda around just fine… Because his style is smooth AND adaptable. Kind of an obvious article, is there anyone who doesn’t want Zarco for 2019? Yamaha will have deep pockets as I’m guessing Rossi won’t be racing on his 40th birthday, Honda will have Pedrosa’s slot and all the money they’d need, Ducati may have Lorenzo’s slot as they probably won’t have Lorenzo. There are some other up and coming riders to vie for those slots, Morbidelli may be promising, though likely has a 2 year contract. Folger looked great this year before being injured. Rins may be competitive if healthy. what is the deal with the yamaha tech3 team anayway, is it a factory team, are the bikes the same or different than what Rossi and Vin ride? Are there any regulations for this? I’m confused how the “satellite” team out performs the factory team…. Sattelite teams generally get versions of the previous years machines, while the factories get the latest and greatest. For Yamaha in 2017 it turned out that the 2016s performed better at most tracks than the 2017 m1s did. In testing this year the Yamaha riders are testing 2016s, 2017s with 2018 motors and 2018s with 2018 motors. THe riders choose which one they want to go with in preseason testing for the next season. Rossi has already said he wants to race next year on the 2016 Yamaha chassis after the last recent testing of `16,17,18 chassis like Zarco did this year. Quite the shuffle potential in 2019 of rising stars, retirements, developing riders and new assignments; Rossi? Pedrosa? Lorenzo? etc., and remember that champions change rides too. So what if Marquez decides to move from Honda, I believe his contract expires at the end of 2018. Should be interesting. If the kid can continue to impress next year and stay healthy, he can look forward to a very fat pay check in 2019. Not MM or Rossi or Lorenzo money, but he will be able to buy whatever he wants for a long time. Whatever he wants, except for a 2014 CB1100 Deluxe. I seriously doubt you’d find many MotoGP riders riding on the street, it’s a dangerous place compared to a race track. I actually expected Zarco to land a factory ride for the 2017 season. It surprised me that he almost went unconsidered. While I have no doubt that Suzuki and Aprilia would love to have him for 2019, I don’t think they have the finances to outbid KTM. Repsol Honda is another story however. I suspect Pedrosa may get his walking papers after 2018 (wouldn’t bet too much money on that, though.) While I think Honda may already be setting the stage for Morbidelli to walk into Pedrosa’s spot, there is no denying that a shot at Zarco would be tempting for them. Think you may be right Norm. He’s still the 4th most productive rider in MotoGP. In 2017 he kept 210 points out of the hands of Ducati and Yamaha riders, finishing ahead of Rossi 9 times, ahead of Vinales 9 times and ahead of Dovisioso 8 times, ahead of Zarco 12 times, ahead of Lorenzo 13 times,and outright won 2 GP’s. He may not be a championship contender anymore, but he’s pretty valuable and trust worthy as a team mate for Marquez at this point. he’s Spanish Brad Pitt. none of us being Catalans i don’t think we fully understand how his long standing popularity with the locals is akin to the larger adoration for Ross. now that they’ve got Murg for the winning, Dan’s really not even there to race a motorcycle anymore. he’s just there to be, well, there. Yet he races pretty well in the grand scheme of things, plus he not a show boater with ridiculous demonstrations after his victories. He’s a quiet gentleman. He doesn’t say controversial stuff and presents himself in the manner you would want representing your product. When he accidentally knocked down Dovi a year or two ago, he didn’t run to his bike, he ran to check on Dovi. 1st class guy all the way! Like I said, I am not going to bet too much on that. Pedrosa is still a fantastic racer. He’s had some serious issues this season keeping the tires simmering. Had that not been the case, he would have been much higher in the points. But I digress… Honda has been looking for another rising star. That was obvious when they fast tracked Miller to MotoGP. Didn’t work out. Now they are going to be watching Morbidelli very closely in 2018. He was a beast in Moto2, and I think Honda has high hopes for him. As dedicated and talented as KTM is, I think MotoGP will be their Waterloo, or Rubicon, or Little Big Horn, for another 5-8 years. It will take them this long to catch up with everyone else’s vast experience in making bikes fast…on pavement. Did you watch any Motogp this year? They are already ahead of Aprilia, and are showing a good learning curve. That’s somewhat a stretch, Aleix Espargo on the Aprilia finished in 15th (missing at least one race), his brother Pol in 17th on the KTM. Being faster than Sam Lowes apparently was not terribly meaningful this year, but both KTMs were. Suzuki was 13th and 16th. Bradley Smith on the other KTM was 21st. KTM is making strides no doubt, but I wouldn’t say they are ahead of Aprilia or Suzuki, but probably will be shortly, and they did have some momentum at the end of the season. If I was betting on who podiums first, I wouldn’t bet much, but my money would be on Aleix on the Aprilia. The out-lap is always gonna be the slowest, no matter how fast you’re going at the end. KTM finished head of Aprilia in both manufacturer and team standings. Their late season momentum will carry it over into 2018. I think Suzuki has figured something out, Rins will be fun to watch, but KTM will be on their heels at Qatar. I admit ot being a KTM fanboy, but the facts are with me on this one. They progressed a lot this year, often surpassing Suzuki who’ve won before (and are a relatively small program). They’ve also won in Moto3, which isn’t easy, either.It’s just a matter of money. If they’re well funded, they’ll get there. Rossi is a top level rider and coming up to his 39th birthday, no reason to retire. KTM will have a dog season first time around, I wish them well and would like to see a podium for them but it isn’t likely for a couple seasons. Hope I can eat those last words. Can’t wait to see how much $ Zarco get’s paid for his next contract, assuming he keeps on riding like he did this year. How do Suzuki finances compare to KTM? Suzuki lost Vinales to Yamaha. KTM can want whatever they want, including MM. Is there anything to make readers suspect KTM’s MotoGP team has the finances (or anything else) to outbid Honda and/or Yamaha? Me doubts it. +1 Red Bull wants a dynasty, and they have the wallet to do it. So…if the larger the “wallet” the greater the mathematical likelihood of winning MotoGP Championships, the math (considering MMs record to date) appears to be MMABROP (MM and Big Red On Parade) through the early-mid 2030s. Further, could the KTM fans please explain how 9% larger market cap + zero race wins + what, one podium, outweighs Yamaha’s MotoGP Championship record? This may be irrelevant, but I presume the market cap of all Yamaha industry is several times the $8B value for Yamaha Motor only. It’s obvious that some people here don’t mix F1 with MotoGP. If they did they would realize the power, finances and determination of Red Bull. No question there will be podiums next year and possibly a championship within the next three years, if, they secure the proper rider for the task. trust me, it’s going to get interesting. KTM is no secondary team. Please be correct, no sarcasm. The thought of “MM and Big Red On Parade” through 2030 is frighteningly boring (MMABROP in homage to Norm). With all due respect, really. “Power” and “finances” are one in the same. There is no such thing as an actual mathematical metric for “determination” so that qualifier is hyperbole. Scroll up for my actual market cap specs, so we have an actual metric for finances. Redbull is worth 20 billion (estimated) and is privately held. Adrenaline sports obviously aligns with their mission, so Redbull is a serious sponsor to have. Being privately held, they also don’t have a bunch of shareholders questioning the company’s capital commitment. That said, I am not as optimistic about KTM’s short term chances as some. Their “strides” that people like to talk about are positive but not earth-shattering. I predict no podium for them in 2018 save for the possible fluke. I also expect them to finish behind all five factory teams and probably the three satellites as well. There is a lot of GP experience in the top three factory teams, and I am not talking about the riders. It is hard to hit a moving target that is already so far ahead. May I respectfully ask for a source? Interestingly, it was also Forbes. I’ll see if I can find it for you when I get the chance and post the link. I confess the source is Forbes by way of my memory, which isn’t always accurate. Also, the link you provided represents the value of the brand, a single intangible asset of the company, not the value of Redbull the company as a whole. Suzuki finances are not so good. They’ve had to leave markets, restructure importers, and enter into some uneasy partnerships. But, if Rossi retires next year Yamaha will kick in a huge offer one would think. And with the possibility of Rossi retiring that leaves Factory Yamaha a lot of coin to work with. Yes, one question I posed to my friends, after last race, where does Zarco go? Who really wants him. How many times did he dive under for a pass! Under Marquez, Rossi, Lorenzo, so many others. How many times has MM done dumb stuff? Look how much he’s matured just this year – the risks he’s taking now are usually around his own limits, not square peg/round hole bike on bike crap…. Ruling out a fast rider due to lack of maturity on track is foolish and not going to happen, slow is always slow, fast can add smart. Q: after last race, where does Zarco go? Yeah, and he did it without actually wiping anybody out (that I remember). I don’t think he’s a Iannone–just an aggressive racer with a lot of talent. Everybody wants a rider like that. Main question in my mind is, can he do it on a different bike? Don’t do it Johann, you’ll be sorry. I disagree. KTM is making great strides with Red Bull’s financial backing.This is the early stages of a power house. You need money to stay on top, Red Bull will show up with “Repsol money”. Zarco can ride that wave. I believe Rossi signed for 2019 (I think), where else can Zarco go? Nope, Rossi is only signed through 2018. He says he will make a decision regarding 2019 and beyond after six or eight races next year, at which point he thinks he will know whether he is still competitive enough to keep going. Rossi had a great year. The odds may not be in his favor to win another championship, but I would think those odds are good enough to keep him in the game another couple of years at least. If I am Aprilia, Suzuki, and KTM, then I will do EVERYTHING possible to get Zarco for 2019. That’s the only way for any of these manufacturers to reach beyond what they are capable of now. Their limits aren’t defined by the riders, otherwise Suzuki would’ve had wins with Iannone. Viñales won on the Suzuki. Iannone just didn’t give a damn. I think Iannone is a very talented rider, good enough to fight for the title with the right bike. Suzuki’s bike was the problem this year. Every GP rider cares about winning. Iannone was scared of the Suzuki because it just didn’t give him feedback, and, when it did, the signals weren’t consistent. Despite what Suzuki wants to think, when a Kamikaze like Iannone is afraid to push your bike and try to ride it fast, the issue is not with the rider. There can be behind the scenes dramas with team managers, contract/ pay issues, corporate B.S.. There are plenty of reasons for any professional, let alone a professional racer who risks life and limb, to give less than 100% effort. Iannone’s complete switch of riding styles is more telling to me than his drop in results. Without suffering major injury, he went from being very bold on the far from perfectly sorted out Ducati to riding super conservative on the Suzuki. That doesn’t spell well for how much of a handfull the Suzuki must have been as this guy has never been much afraid hitting the tarmac and other motorcycles. Zarco seriously needs to be next in line to replace either Rossi or Dani in 2019.